Cam lock keeps jewelry or other products safe! Hinged door for easy access to merchandise! 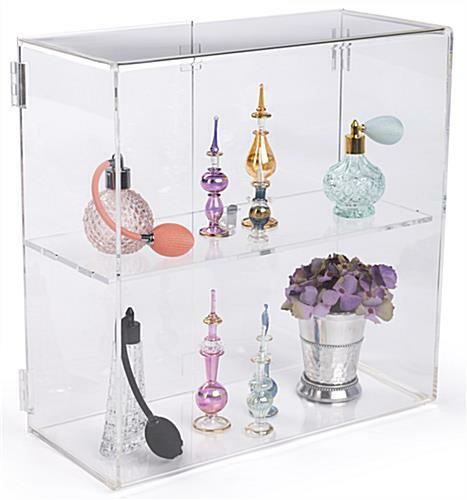 Crystal clear acrylic cases are an affordable alternative to glass display cases! 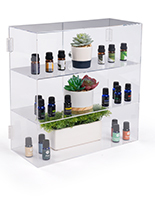 These countertop display cases are a great choice for retail stores looking for inexpensive, yet effective store fixtures or showcase displays. 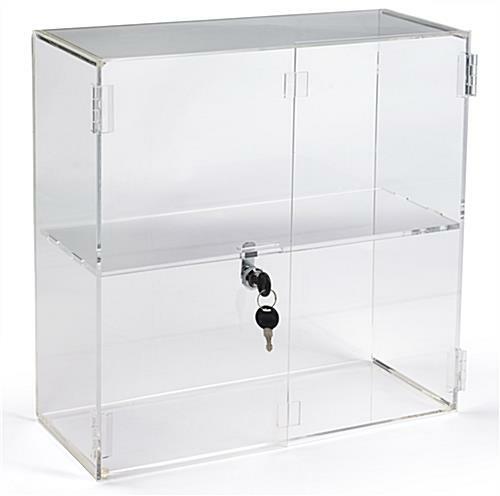 The countertop display cases, also known as countertop retail showcase displays, offer users a safe place to store and display model cars, electronics, bakery items, fine glass-ware and much more! These countertop display cases are an excellent alternative to full-size glass counters or other larger countertop store fixtures. 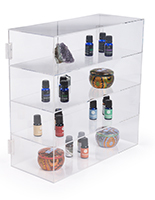 Countertop display cases can also be used to display specialty pieces in a jewelry store. 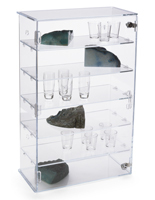 These countertop jewelry showcase displays, countertop display cases are crafted from crystal clear acrylic to offer an affordable alternative to real glass countertop showcase displays. Acrylic offers the same visibility as glass without the high cost and it is much more resilient to breakage! 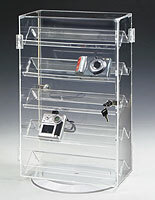 Countertop display cases feature a cam lock with a set of two keys to keep items safe. A shelf sits midway between the top and bottom of these countertop showcases to offer two levels of showcase space. Hinged doors open to allow full access to displayed items. These doors can either face customers or the store associate. 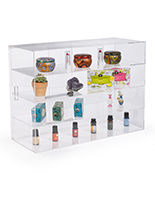 Rubber feet keep these countertop display cases sturdy and prevent slipping on counter top areas. Why pay for custom countertop cases? We have a huge selection of stock cases available! Please Note: Inner shelf is not removable. 16.9" x 16.5" x 7.4"
This product does not ship well. The first one came with both doors broken off at the hinges. The customer service was great and a replacement sent immediately. The second one received only had one hinge broken and I was able to fix it. It's a good product for the price, but have to be careful with it as it is easily broken. Angel, thank you for taking the time to share your experience with us. We're so sorry that your display case arrived broken, but we're glad our customer care team was able to provide a quick and satisfactory solution. We appreciate your patience and understanding, and we hope you enjoy your new display case. Don! Love the 5 stars, thank you! Glad these display cases are helping you out at the farmer's markets. We hope you you have a great season and if you have any images of your display case in action we'd love to see them. Good product, good price, packed well, delivered in a timely manner. Would recommend. We recently ordered 5 of these display cabinets. When we received them, one was damaged. I called Displays2go to report the damage and another unit was sent out the following day. I was very impressed with the level of response and eagerness to correct the problem. We will certainly be ordering more items from this vendor. We're so glad to hear we were able to rectify that problem for you, Mary! We can't wait to work with you again soon. I like this cabinet quite a bit. It'll attract dust a bit because of the static electric properties of acrylic but the clarity is phenomenal. Dry fingerprints won't show most of the time when physically manipulating the cabinet itself. I keep nendoroids in mine. Thank you for the review, Roberto. If you are planning on ordering from us again, feel free to like us on Facebook; we offer various social media-exclusive discounts and deals that you may be interested in for future orders!